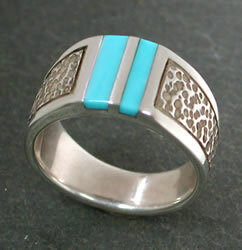 Our inlay rings are done with precision with tight fitting stones. All these stones vary somewhat in appearance as they are natural materials. 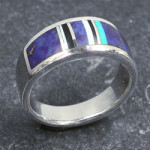 With these rings it is vital to order the correct ring size, because we can bend metal but not stones so sizing a ring makes the inlay break. If you need a size not in the Paypal menu, contact us directly. 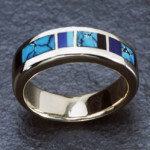 Turquoise is stabilized to prevent skin oil absorption, changing the color. 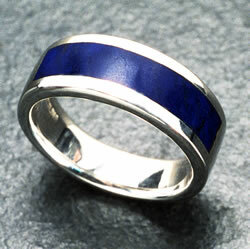 Black onyx is dyed, a standard practice. 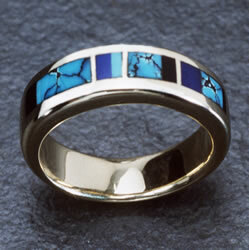 We only use stone treatments that do not have to be renewed, for long wear and enjoyment of your ring.